The 2-way full range TSP152-AN is a 2,500 Watt 15" powered loudspeaker system that is ideally suited for a wide range of portable and fixed installation speech and music sound reinforcement applications. Designed to work individually without a controller, the TSP152-AN provides optimal performance for FOH, sidefill and delay line loudspeakers, and is an exceptional choice for wedge monitoring applications. It also offers the flexibility to accommodate venue-specific requirements for install applications. 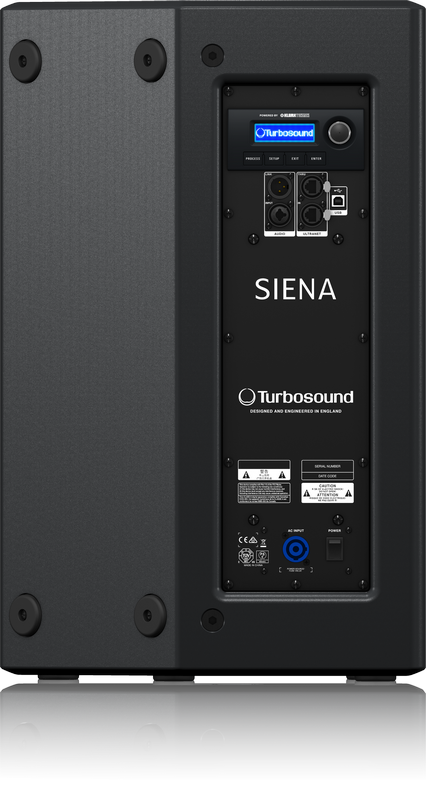 TURBOSOUND is recognised the world over for designing and building some of the most iconic loudspeakers and subwoofers. We take meticulous care and pride in maintaining that reputation by utilising only drivers designed specifically for each application – it’s what sets us apart from the competition. The TSP152-AN loudspeaker features a 15" low frequency driver with an inside/outside wound low mass voice coil for improved transient response and an titanium dome 1" high frequency compression driver, which is mounted on a 70° horizontal by 50° vertical dispersion low distortion waveguide. Equipped with a very efficient and lightweight KLARK TEKNIK Class-D power amplifier, the TSP152-AN provides an impressive 2,500 Watts of output power in a highly portable and lightweight package. Class-D amplification makes all the difference, offering the ultimate in energy efficiency and eliminating the need for heavy power supplies and large heat sinks. A high degree of control over the loudspeaker system's performance is managed by a sophisticated, but easy to use KLARK TEKNIK Digital Signal Processor (DSP), which provides dynamic EQ and transparent limiting for the utmost punch and definition at high output levels – and long-term reliability. On the rear panel of the amplifier module, the user interface‘s LCD display and single rotary encoder provide intuitive access to: position compensation, user EQ control, subwoofer integration and signal routing features. In addition to the balanced XLR input, an XLR output is provided for daisy-chaining more active loudspeakers or for use with active subwoofers. An onboard USB port provides access for remote control of the TSP152-AN via a free PC computer software download from turbosound.com – as well as convenient DSP firmware updates.